AS Pest Control provide an efficient, affordable and professional wasp control service in Mansfield. Available 24/7 we offer a quick and reliable service to conveniently remove the wasp problem. As well as treatment we can also remove the nest. If you find wasps in a wall, roof or your garden do not approach them, this can agitate the wasps and make them more likely to sting. A single wasp nest can contain up to 7,000 wasps. If you can see large numbers of wasps going in and out of a hole this is normally the entry point, DO NOT cover this entry hole it will just make the wasps angry and aggressive and force the wasps to find another entrance which could be inside your house. 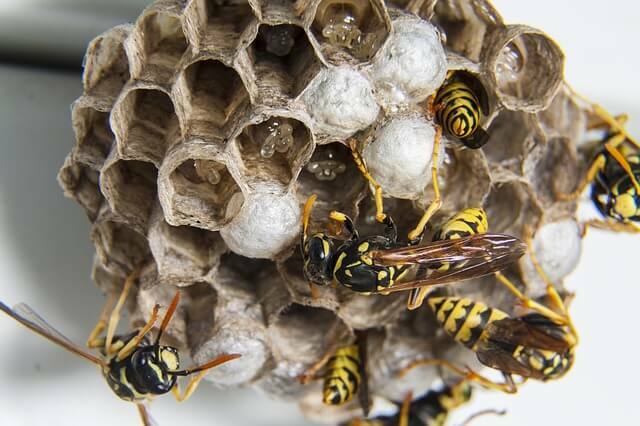 Contact AS Pest Control and we can provide a free onsite wasp nest control quotation and advise on the best way to deter wasps from your property in the future. Wasps are one of the most feared and aggressive pests around. They tend to reach their peak in August and September as their youngsters are reared and the workers turn to sweet food they prefer - wherever it is available to them. Sometimes when unprovoked but normally when annoyed or threatened wasps will sting a human target in the vicinity. This can be very dangerous for some people who react violently to being stung. AS Pest Control provide Wasp Control in Mansfield from only £48. Wasp nest removal £10. AS Pest Control will always assess the wasp nest and use the most appropriate treatment for each case. The most common application of treatment for wasps is an insecticidal dust to the nest, around and into the entrance. Liquid surface sprays can also be used. For control of adult wasps, space sprays can be used indoors or surface sprays can be applied in localised areas. Without professional equipment and training these treatments can be extremely hazardous. Once we have completed the treatment the nest will remain in a hyperactive state for up to 3hrs but usually wasp activity will stop much sooner. During this time keep people and pets away from the area until any activity has ceased. Close windows and warn neighbour's to keep away. A wasp nest cannot move from its location. Once started it will be there for the duration of its life (7-8 months). Wasps will not move from one nest to another. All wasp nests start in the spring but the expanding population is not often noticed until much later in the year. The populations starts at 1 and expands to 10,000 by the autumn. Never block the entrance to a nest unless you are quite sure the nest is dead e.g. Wasps are not flying in and out of the entrance. AS Pest Control provide a local, affordable wasp control solution for residential and commercial customers in Mansfield, Nottingham, Derby, Chesterfield, Worksop and surrounding areas.